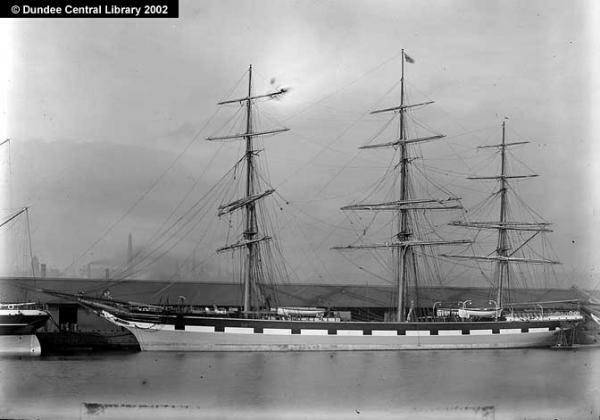 David Bruce started as an agent for SS Narwhal, invested in all manner of cargo, whaling and sailing ships and ended up as a ship owner, also ship and insurance agent, with business interests in Dundee and London. 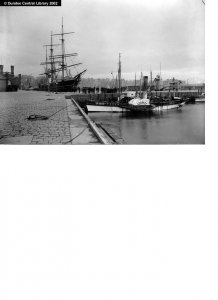 Subscriber 89 – Gourlay Brothers – who built ships for David Bruce & Co.
A young man in his twenties, David Bruce was engaged as a flax merchant / ship agent at the time of making a subscription towards the building of the Albert Institute. David Bruce was born to David Bruce and Ann Kirkcaldy on 16th July, 1837 in Dundee. He was the eldest of four children: David; Helen Russell; Isabella and William Mark Kirkcaldy Bruce. 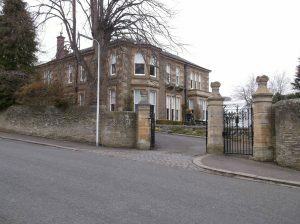 In 1841 his parents and family were living in Mid Road, Dundee with David’s father described as a journeyman mechanic. 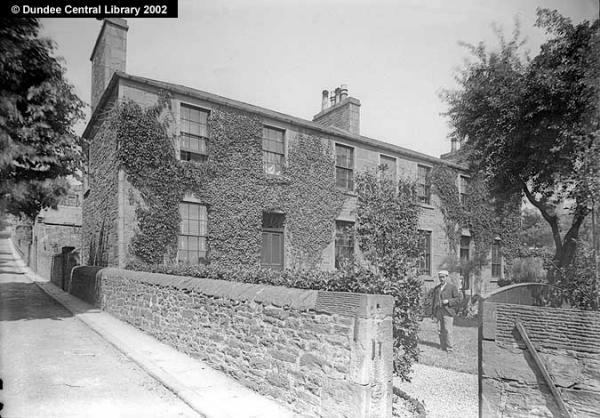 By 1851 David was a scholar and his father was an engineer fitter with the family then living in Law’s Land, Hilltown. Life by 1858 seemed to be improving for the family as David’s father appeared in the Dundee Directories as a collector for the Dundee Gas Light Company and their home address was 8 Reform Street. In the 1861 census the family were living at 7 George’s Place. David’s father still worked as a collector for the Dundee Gas Light Company and David was reported as being a flax merchant. However, in the Dundee Directory for 1861 he is described as an agent for SS Narwhal, East Dock Street. David Bruce married Margaret Scott on the 15th June, 1864 in Logie, Perth. Margaret and David Bruce started married life as tenants of a house at 1 Strawberry Bank. 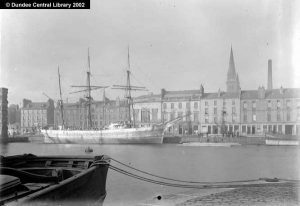 David Bruce seems to have been an energetic and ambitious man and, from being an agent for one ship, by 1867 he was joint manager of the Dundee Seal and Whale Fishing Co. In 1869 David, his wife Margaret and family moved to 4 Douglas Terrace, Broughty Ferry. His career seemed to be taking off and, from then on, David became involved in a variety of companies such as becoming the Manager of Anthony Gibb & Son, Manager of Dundee Soap Company and a Director of the East Coast Salvage Company Ltd. He also joined numerous committees associated with the Port of Dundee and its trades, where David must have met some of the most influential and wealthy Dundonians of the time. 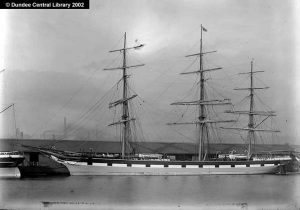 The Clipper Line and David Bruce & Co.
Now David Bruce was not only the manager but owner of a shipping line. His brother, William Mark Bruce, was part of the company and the Cox family backed the venture. During this period, the firm of David Bruce and Co was still flourishing, having changed its emphasis, amongst other things, to transporting emigrants to Australia and New Zealand. Then in 1894 David must have been proud of how far he had come when he took the Oath Of Allegiance as a Justice of the Peace for the County of the City of Dundee and then also as a Justice of Peace connected with the Dundee District of the County of Forfar. The end of the Dundee Clipper Line. However, towards the end of the nineteenth century when the whaling industry was in decline, the Clipper Line was voluntarily wound up. That the Company be wound up voluntarily under the provisions of the Companies Acts, 1862 to 1890. That George Addison Cox, Merchant, Dundee; David Bruce, Shipowner, Dundee; Alexander Gilroy, Merchant, Dundee; James Cox Methven, Merchant, Dundee; and James Nicoll Smith, Merchant, Dundee, be, and they are hereby appointed, Liquidators for the purpose of such winding up, and that all the powers competent to the Liquidators may be exercised by their majority, which majority shall also have power to decide any questions as to which there may be difference of opinion amongst the Liquidators. Perhaps this prompted David Bruce to move to London as in 1897 David Bruce went to live and work there, although still retaining an office in Dundee. In 1898 he advertised his Dundee ships for sale, as suitable for the Antarctic, but was still a shipowner in 1901 when his address was Linden Gardens, Kensington. In 1911, after a long and full working life, he was living in Cranleigh and retired. David Bruce was obviously ambitious and was the epitome of the old phrase ‘local lad done good.’ He not only had business acumen and energy but the desire to donate money to a substantial and civic legacy in the shape of the Albert Institute. He also has a personal lasting legacy in that there still exists, in 2018, a firm bearing the name David Bruce & Co.(Shipping) Ltd. in London. Unfortunately, the original David Bruce & Co. were bombed in 1945 and all the records pertaining to the Dundee days were destroyed but a substantial amount of information still exists in a variety of sources because of the pivotal role he played in Dundee of the nineteenth century. 1837. Bruce, David. (Old Parish Registers, Dundee. Births. 16/07/1837. 282/180 118) ScotlandsPeople website. David Bruce, Margaret Scott (Statutory Registers. Logie, Perth. Marriages. 374/8) 1864. ScotlandsPeople website. [qq]Dundee Post Office Directory, 1861-62. p.120. Printed by Bowes Brothers. Dundee City Archives. Dundee Post Office Directory, 1864-65. p.101. Printed by James P. Matthew, Dundee, Dundee City Archives. Dundee Post Office Directory, 1867-68. p.104. Printed by James P. Matthew, Dundee. Dundee City Archives. Dundee Post Office Directory, 1871-72. p.370. Printed and Published by James Mathew and Co., Dundee. 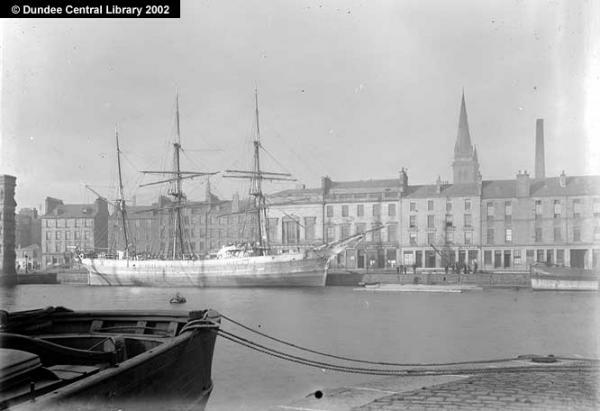 Local History Centre, Dundee Central Library, via National Library of Scotland. Dundee Post Office Directory, 1874-75. p.447. Printed and Published by James Mathew and Co., Dundee. Dundee City Archives. Dundee Post Office Directory, 1876-77. p.464. Printed and Published by James Mathew and Co., Dundee. Local History Centre, Dundee Central Library. Dundee Post Office Directory, 1878-79. p.114. Printed and Published by James Mathew and Co., Dundee. Local History Centre, Dundee Central Library. Dundee Post Office Directory, 1879-80. Printed by James Matthew and Co., Dundee. Dundee City Archives. Dundee Post Office Directory, 1896-97. p.684. Printed by James Matthew and Co., Dundee. Dundee City Archives. Dundee Courier. Wednesday 4th July 1917. p. 2. Local History. Dundee Central Library, Wellgate. Nine trades of Dundee, Mariners and Seamen. (1876-1900) p.5. Nine Trades of Dundee. Mariners and Seamen. December 1884. (1876-1900). p.8. Dundee Post Office Directory, 1871-72. p.558. Printed by James Matthew and Co., Dundee. Dundee City Archives. Dundee Post Office Directory, 1880-81. p.68. Printed by James Matthew and Co., Dundee. Dundee City Archives. Dundee Post Office Directory, 1874-75. p.41. Printed by James Matthew and Co., Dundee. Dundee City Archives. Dundee Post Office Directory, 1882-83. p.70. Printed by James Matthew and Co., Dundee. Dundee City Archives. Dundee Post Office Directory, 1882-83. p.53. Printed by James Matthew and Co., Dundee. Dundee City Archives. Dundee Post Office Directory, 1876-77. p.22. Printed by James Matthew and Co., Dundee. Dundee City Archives. Dundee Post Office Directory, 1884-85. p.35. Printed by James Matthew and Co., Dundee. Dundee City Archives. Nine Trades of Dundee. Mariners and Seamen. December 1884. (1876-1900). p.5. Dundee Post Office Directory, 1884-85. p.54. Printed by James Matthew and Co., Dundee. Dundee City Archives. Justice of the Peace (Dundee) - Oath of Allegiance (JP 32/1/2). (1894). p.32. Dundee City Archives. Dundee Post Office Directory, 1867-68. p.21. Printed by James Matthew and Co., Dundee. Dundee City Archives. Dundee Post Office Directory, 1871-72. p.80. Printed by James Matthew and Co., Dundee. Dundee City Archives. Dundee Post Office Directory, 1880-81. p.114. Printed by James Matthew and Co., Dundee. Dundee City Archives. Dundee Post Office Directory, 1898-99. p.178. Printed and Published by James Mathew and Co., Dundee. Local History Centre, Dundee Central Library. 1841. Bruce, David. (Census 282/67/1). p.1. ScotlandsPeople website. 1851. Bruce, David. (Census 282/49/28). p.28. ScotlandsPeople website. 1861. Bruce, David. (Census 282/114/3). p.3. ScotlandsPeople website. Dundee Post Office Directory, 1867-68. p.105. Printed by James Matthew and Co., Dundee. Dundee City Archives. Dundee Post Office Directory, 1869-70. p.19. Printed by James Matthew and Co., Dundee. Dundee City Archives. Dundee Post Office Directory, 1869-70. p.125. Printed by James Matthew and Co., Dundee. Dundee City Archives. Dundee Post Office Directory, 1884-85. p.73. Printed by James Matthew and Co., Dundee. Dundee City Archives. Dundee Courier. Friday, 31 July 1874. p.2. Local History, Dundee Central Library, Wellgate. 1846. Bruce, William Mark. (Old Parish Registers,Dundee. Births. 11/12/1846. 282/190 281 ) ScotlandsPeople website. The Ingram Papers - Dundee Fleets. D31101. p.3. Local History, Dundee Central Library, Wellgate. The Ingram Papers - Dundee Shipbuilding. D31093. p.4. Local History, Dundee Central Library, Wellgate. The Courier - Mail (Brisbane). Saturday, 27 January 1934. p.18. Courier and Advertiser. (Perth and Perthshire Edition) 14 May 2016. p.3. British Newspaper Archive website. Dundee Post Office Directory, 1895-96. p.107. Printed by James Matthew and Co., Dundee. Dundee City Archives. The Ingram Papers - Dundee Shipbuilding. D31093. p.62. Dundee Telegraph extract (Saturday 22 November, 1952) Local History, Dundee Central Library, Wellgate. Edinburgh Gazette. 6 July 1897, p.641. British Newspaper Archive website. The information above about David Bruce has been collated from a range of digital and hard copy sources. To the best of our knowledge it is correct but if you are relying on any information from our website for the purpose of your own research we would advise you to follow up the sources to your own satisfaction. If you are aware of an inaccuracy in our text please do not hesitate to notify us through our Contact page.